Many people believe there is a right to dispose of their property on their own terms when they die. This could be outlining who is included and how much they should receive. Many believe this to be a natural right which should be unrestricted. Others disagree. The law outlines when and how much restrictions should be applied. In NSW, the Government is neither for nor against the free disposal of property. Instead they focus on ensuring the outcome is fair. This is done by balancing the provision and support of people who should be entitled to it (what they should receive) with reasonable disposition of property. Basically, family provision legislation attempts to minimise the injustices which some Wills may cause. To be rectified, a person (that should be provided for) must make a family provision claim. The primary source of legislation is the Succession Act 2006 (NSW) ‘The Act’. The Amendment in 2009 extends the scope of people eligible to make a family provision claim, when the will does not adequately provide for them. 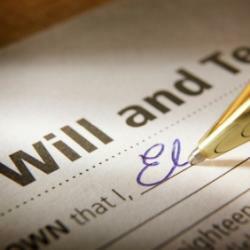 Generally, if the deceased has a spouse, then they will be the beneficiary of the provisions. However, things become more complicated when there are multiple spouses, children from other spouses and children from the deceased with no spouse. Adoption, IVF and surrogacy further complicate the matter. Essentially, anyone who is left without adequate provisions in the Will may be able to submit a claim. When there is a spouse and a child from another relationship, the spouse shall receive a legacy of $350, 000 (changes according to the consumer price index and formula in legislation), plus the personal effects of the deceased and half of the remainder of the estate. The other half is given to the child. Where there are no spouses and multiple children, the estate is divided equally (Succession Act 2006 (NSW)). ‘The Act’ s 57 outlines that a child or grandchild of the deceased may make a claim. This includes children who were adopted, had parents from a de facto relationship (2 years). For gay women, the child is considered to be that of both parents, where there is a long term welfare responsibility (see Children and young persons (care and protection) Act 1998 and Status of Children Act 1996).Meaning that under law, a child who is adopted or who was owed welfare by an adult may make a claim regardless of their age (Family Provision Act 1982 (NSW)). A rift in relations between the deceased and the child may be used as a reason to decrease or deny the allocation of provisions in a Will. The child will still be able to make a claim, however the cause of the estrangement is most important. Ideally, there should be no presumption of fault by the child, or any notion of acting unreasonably. If the actions of the deceased can be justified, then provisions may be excluded or reduced (Andrew v Andrew (2012) NSWCA 308). The court may still grant the child a provision, due to believing the deceased owed the child a moral duty (Keep v Bourke (2012) NSWCA 64; Succession Act 2006 (NSW)). Within 12 months of the death of the deceased (s 58), a person may make a family provision claim (plaintiff) by filing a summons or in some circumstances, a statement of claim outlining their name, that of the executor and date of death of the deceased. Along with the summons, affidavits by the plaintiff supporting their claim and of legal costs, a notice outlining the name and contact information of eligible persons for a provision should be provided up until 5 days until the first hearings. Claims may be held in the District Court, however due to limitations on cases over $250, 000, most cases are held in the Supreme Court (District Court Act 1973 s 134(1)(c) s 2; District Court Rules 1973 Pt 51 D R2). The claim is then entered into and managed in the Family Provision List within the Equity Division of the Supreme Court (if it is a claim only for the provision). The Court will use a two-step approach to determine the application. Firstly, it needs to be determined if the provisions were inadequate and improper for the maintenance, education and advancement of the child in their life. If it is considered inadequate, the court then seeks to determine the amount they should receive. Factors such as the relations within the family with the deceased, nature and extend of perceived obligations, financial resources, character, conduct and disability of the child, and the liability of the deceased to support the child. The Plaintiff may receive a lump sum payment and periodic payments, or any other methods as the court sees fit. In the case of a minor (under 18), the provision is not deferred until they are 18, they received it immediately (s 138). My previous positions have included working with families and individuals experiencing family, substance, housing and employment issues.